In this module we will explore brinksmanship in three different settings. We will start with the Cuban Missile Crisis and then turn to a dispute between neighbors in a New York City apartment building. Finally, we will examine exploding offers. Each of these examples offers practical lessons for everyday negotiation. But first, consider this parable. Two dynamite trucks are speeding towards each other on a narrow road. Both drivers know there will be a fatal collision if neither swerves. Yet the two drivers still barrel ahead, each counting on the other to do the rational thing — namely, get out of the way and prevent disaster. The story is one of ultimate brinksmanship, where each party demonstrates its willingness of suffer great loss in order to force the other to capitulate. Such a stance sometimes leads to victory. Other times, everyone suffers. Thomas Schelling's classic book, The Strategy of Conflict, uses examples like this to explain the dynamics of more complex real world stand-offs. Schelling was a foreign policy analyst/adviser who wrote during the height of the Cold War. Years later he was awarded the Nobel Prize in Economics for this and other work. Reason: Whoever is the more rational party and who understands the risks, will be the one more likely to blink. Resources: The more resources a party has to lose, the more vulnerable he or she is. Communication: A party that is less able to receive a message is less vulnerable to threats. When Schelling wrote The Strategy of Conflict, the United States and the Soviet Union had been engaged in an arms race for more than a decade. Unilateral disarmament was in neither side's interest. A willingness to resort to nuclear warfare was a dark shadow cast over every confrontation between east and west. Somehow the policy of "mutually assured destruction" (MAD, for short) kept the world from going over the brink. But, for both sides, there was always the risk of a miscalculation of the other party's motives and resolve. Tensions mounted when the conflict in Korea stalled in the early 1950s. Some American hawks urged dropping nuclear bombs to break the deadlock. More prudent voices warned about escalation and they prevailed.Then in 1961, the Soviets and East Germans walled off the western sectors of Berlin, gambling (correctly, as it turned out) that the United States and NATO would not respond militarily. A year later, in October of 1962, the Soviets gambled again by installing nuclear armed ballistic missiles in Cuba, once more counting on forbearance on the part of the United States. This time the outcome was anything but certain. 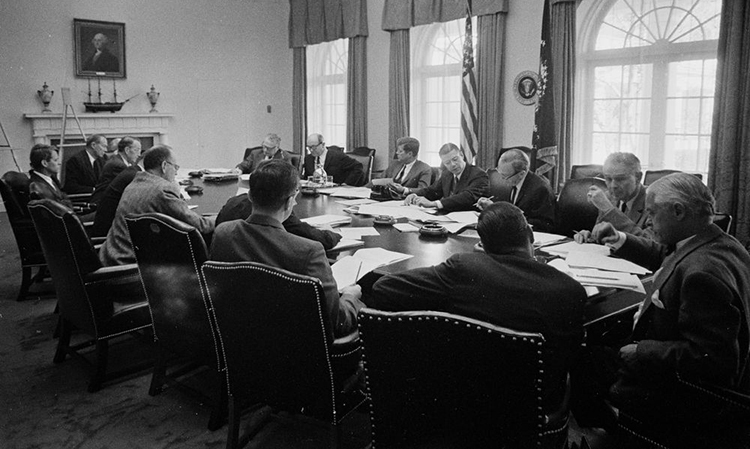 Meeting of the Executive Committee of the National Security Council. October 29, 1962. The Cuba Missile Crisis is an archetypical example of brinksmanship. It has been studied in depth by scholars of diplomacy and negotiation. New insights continue to emerge as archived material has become available. The case illuminates aspects of far more commonplace (and less harrowing) conflicts today. We will examine five such points here (click on each point to learn more). On October 22, 1962, President John Kennedy announced on television the discovery that Soviet missiles were being installed in Cuba. He demanded their immediate removal. That result and its timing were not up for negotiation. Furthermore, Kennedy declared that if any of the missiles were fired in the US, it would be regarded as an attack by the Soviet Union requiring "a full retaliatory attack" on that nation. By making this statement publicly, Kennedy deliberately painted himself into a corner from which it would be hard to retreat. Half measures would not suffice. Nor would a summit conference. By stating his position clearly, the President meant to force the hand of the Soviet Premier Nikita Khrushchev. He could only hope that his counterpart would respond rationally. 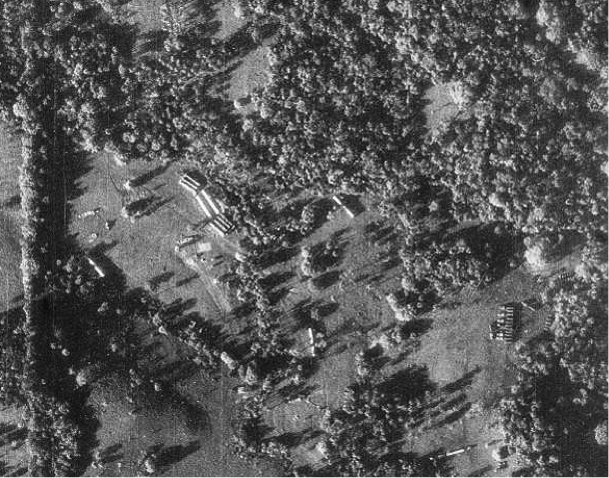 A US reconnaissance photo showing Soviet missiles, transports, and tents for fueling and maintenance. Engaging the Soviets publicly rather than through secret diplomacy demonstrated Kennedy's determination, though necessarily at the cost of making it harder for Khrushchev to concede. Backing down could cost the Premier credibility internationally and at home. Even so, this approach seemed better than proceeding privately. Talks with the Soviets could drag on, and all the while they could harden their position in Cuba. When parties are at or near the brink, choices often involve picking the least worst option. It is prudent to preserve some room to maneuver. In his televised statement Kennedy declared a naval blockade of Cuba. All incoming vessels would be searched before they would be allowed to proceed to the island nation. Some ships that had been approaching the quarantined area reversed course and headed back to Russia. Others were allowed to pass after being boarded and inspected. It was a dangerous operation. Freighters jostled with US Navy ships. Soviet submarines were patrolling nearby. An inadvertent accident could escalate tensions. To buy time and reduce the risk of accident, Kennedy shrunk the size of the blockaded area. He wanted decision makers on both sides of the conflict to have more opportunity to weigh their alternatives. Think like a chess master: play both sides of the table. Three channels of communication were used during the crisis. One was the public airways. Kennedy used his broadcasts to lock himself into the position that the Soviet missiles must be promptly removed. There were also private diplomatic meetings and communiqués between envoys from each country, though little progress was made through these exchanges until the very end. Later it was learned that important steps were also taken outside of these channels. Several days after Kennedy's first announcement, Pope John XXIII sent a message to the Soviets stating, "We beg all governments not to remain deaf to this cry of humanity, "and asking that they do "all in their power to save peace." With permission of both Khrushchev and Kennedy, the Pope's plea was made public. The very act of the two governments agreeing to the release of the statement was a tentative but important step towards a constructive dialogue. Shortly after that, on October 26, television newsman John Scali had a secret lunch with Aleksandr Fomin (who was actually KGB spy Alexander Feklisov). Perhaps on instruction from the Politburo, Fomin said that war seemed imminent. He asked Scali to contact high-level friends in the US State Department to see if there might be interest in a diplomatic settlement. Specifically, he asked whether, if the missiles were removed, and if Fidel Castro publicly announced that he would not accept such weapons in the future, would the United States publicly announce that it would not invade Cuba. Early that same evening the State Department received a long letter by cable that appeared to be written by Khrushchev himself. It proposed a resolution much like the one that Fomin had floated earlier in the day. Further study was required, yet it appeared as if the stalemate had been broken and that only the details needed to be ironed out. But that didn't prove to be the case. Enlist intermediaries to break stalemates. Three channels of communication were used during the crisis. One was the public airways. Kennedy used his broadcasts to lock himself into the position that the Soviet missiles must be promptly removed. There were also private diplomatic meetings and communiqu�s between envoys from each country, though little progress was made through these exchanges until the very end. Later it was learned that important steps were also taken outside of these channels. Several days after Kennedy's first announcement, Pope John XXIII sent a message to the Soviets stating, �We beg all governments not to remain deaf to this cry of humanity,� and asking that they do "all in their power to save peace." With permission of both Khrushchev and Kennedy, the Pope�s plea was made public. The very act of the two governments agreeing to the release of the statement was a tentative but important step towards a constructive dialogue. Shortly after that, on October 26, television newsman John Scali had a secret lunch with Aleksandr Fomin (who was actually KGB spy Alexander Feklisov). Perhaps on instruction from the Politburo, Fomin said that war seemed imminent. He asked Scali to contact high level friends in the US State Department to see if there might be interest in a diplomatic settlement. Specifically, he asked whether, if the missiles were removed, and if Fidel Castro publicly announced that he would not accept such weapons in the future, would the United States publicly announce that it would not invade Cuba. At 9 AM the next day, Moscow issued a more belligerent message, one that conditioned the Soviet removal of its missiles in Cuba with the Americans removing its Jupiter missiles from bases in Turkey and Italy. Analysts interpreted the demand as coming from hardliners in the Soviet government. If so, there was dissent among their leaders, just as there was within Kennedy's Executive Committee. There was growing concern that Khrushchev's control over his own government was shaky. 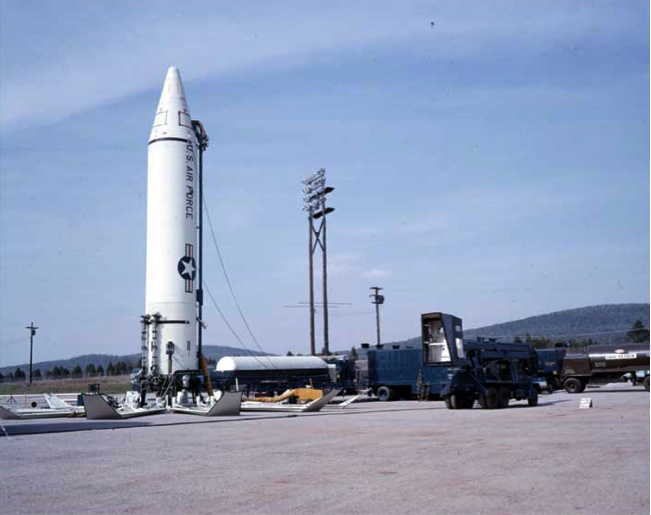 One of 100 U.S. missiles installed in Turkey and Italy in 1961. Most of the American team agreed that the Soviet's new demand was unacceptable. They believed that the Soviet move in Cuba had upset the existing balance of power. They didn't want to set a precedent whereby future such moves could be used as bargaining chips for dismantling US installations elsewhere. The governments of Turkey and Italy were strongly opposed to the proposal, as well. Tensions escalated when a second message came in from the Soviets two hours later, reiterating the trade demand. Things got worse when a US reconnaissance plane was shot down, killing the pilot. Kennedy waivered on how to respond. Previously he had told his team that he would retaliate were that to happen. But when faced with the decision, he realized that the hostile action might have been taken independently by a Soviet officer, operating on his own without orders from higher up. In the midst of all this, the Americans still had to respond to the new, harsher Soviet demand. Attorney General Robert Kennedy (and likely others, as well) reportedly argued that it simply be ignored. Refusing the demand would only paint the Soviets more tightly into a corner. Instead, they suggested building on the positive points in Khrushchev's earlier message. And that's what supposedly ensued. The Soviets announced they were removing the missiles, and the United States pledged it would not invade Cuba. That was the accepted story for several years, but, as information leaked out, it became apparent that the agreement was more complex and subtle. While public statements made no mention of removing the missiles in Turkey, at the insistence of US Secretary of State Dean Rusk, oral assurances were given to Soviet Ambassador Anatoly Dobrynin that they would be decommissioned "voluntarily" not long thereafter. Keeping that provision out of the written agreement was a face-saving measure for the United States. When the missiles were removed, the explanation was that they had become obsolete in light of the capability of the growing US fleet of nuclear-powered, heavily armed submarines. The encounter was not truly a game of chicken in a pure game theoretic sense. It was far more complex. Each side had a range of options, not merely swerve or rush straight ahead (as in the case of the dynamite trucks on a collision course). And though events unfolded rapidly in this case, there was time for reflection and carefully measured action. Recall how Kennedy maintained the quarantine but shrunk its size, and how the Soviets prevailed on their demand that the Jupiter missiles be withdrawn from Turkey, though not immediately. Brinksmanship is a high risk strategy, one that requires making credible commitments and communicating them clearly, as Schelling's analysis emphasizes. It also requires a rational counterpart who will make the choice you prefer. Luck factors in, as well. If both parties simultaneously venture too close the edge, disaster may ensue. The Board of a co-op apartment building in New York City enacted a rule requiring everyone to install and pay for child safety bars in their windows. One particular owner refused to pay, insisting that the Board pick up the cost, which in this case was $902. The Board, made up of neighbors in the building, felt compelled to uphold its legal authority and retained a lawyer (for $315) to write a letter demanding payment. The Board hoped the owner would relent, but he was adamant, so it filed a suit. The owner retained his own attorney, and the parties headed to court. Complete the activity below to learn more about how this scenario unfolded and to share your own perspective. Then, continue reading the analysis below. Take a look at your initial responses in the open tab. If you predicted that this minor squabble would escalate into such a costly dispute, congratulations on your foresight. But the parties themselves surely didn't anticipate this outcome. Nobody planned on investing so much time, money, and emotion in a lose-lose proposition, yet that was the result. From the start, each side assumed that the other would come to its senses and abandon the fight. Instead, they both dug themselves in deeper and kept on shoveling. The first set of questions after this mini-case was introduced get at the importance of foresight. Decision expert Gary Klein stresses the importance of conducting what he calls a premortem before undertaking any important action. Instead of asking if anything might go wrong, imagine instead that you are underway and something has gone wrong: what is it? Klein's research shows that phrasing the question this way sharpens people's foresight. They recognize more things that could go amiss and realize that they are more likely than anticipated. When the Board was considering a lawsuit, if just one member had posed Klein's question "imagine something goes wrong here" it's likely that someone would have said, "Well, the owner might be just as obstinate as we are." If so, others might have asked how far the group was prepared to go. Someone else might have chimed in by asking, "Should we think about mediation instead of a lawsuit?" The whole dispute might have been nipped in the bud. At the very least, as events unfolded, the Board would have been quicker to realize where litigation was taking them. The second set of questions, following Part Two of the activity, has to do with perspective. While the stakes in this situation were trivial compared to the Cuban Missile Crisis, taking the point of view of the other side is important whatever the context. Kennedy understood that clearly in 1962. The neighbors in this dispute apparently did not. William Ury, author of Getting Past No,coined the term "going to the balcony" to describe the value of psychological distance. (The concept is described in the Interpersonal Dynamics module of the Openings unit.) Negotiators must be center-stage, of course, and intimately engaged with their counterparts, yet they must also have the perspective of someone sitting way back in the audience watching the drama unfold. Maintaining that stance requires emotional balance, which can be especially hard when people firmly believe that they are right and others are clearly wrong. The questions following Part Three raise the issue of power. In this instance each side felt that it had the law on their side, but that pendulum swung back and forth, depending on which court was hearing the case. As was explained in the introductory section and in the analysis of the Cuban Missile crisis, power is also established through a party's ability to commit to a course of action, heedless of cost. It is easy to fall into the trap, however, that we are being virtuous when we are resolute. But when we face someone else doing the same thing, we tend to view them as acting irrationally. Then there is the sunk cost trap. In this case, as each side poured more and more money into the dispute, their need to justify past behavior grew more powerful. Finally, the questions following Part Five raise the issue of process. This dispute may have been harder to resolve because it was between an individual and a larger group. Social psychologists have found that hard-liners often have disproportionate influence within teams. More moderate voices are vulnerable to being charged with disloyalty or weakness. An us/them outlook can develop. The condo owner, in turn, may have felt he was being ganged up on and that he had to defend himself. The dispute wore on for years, but finally reached a settlement. In an interview with a Wall Street Journal reporter, the owner said afterwards, "I'm a man converted. Anything you can possibly do to avoid a lawsuit, do it." It's not clear whether any outsiders tried to break deadlock informally. Somebody might have quietly suggested to the owner that he save face by donating $902 for some other common use, without backing down on the legal principle. Or perhaps another resident, caught in the crossfire, could have made the case go away by anonymously sending the board $902 in cash to cover the cost of the window bars, a bargain compared to the mushrooming legal costs. In hindsight other people affected by the dispute may regret not intervening. But the co-op board's lawyer wasn't chastened. He told the Journal, "I think the expenditures here were appropriate and were pretty much kept to a minimum." He claimed that his clients "had an idea of what was going on" throughout the case. "There were no surprises." The lawyer's attitude betrays a fatalistic commitment to a strategy even when there's mounting evidence that it's not working. Our first two examples involved parties locked in conflict, relatively minor in the co-op case, potentially cataclysmic in the former. Brinksmanship can take place in the deal-making context, as well. Here's an exercise about a fairly common practice in the job market. Quiz: Imagine that you've decided it's time to shift jobs. You have a good resume and strong recommendations, so you are justifiably confident that you can soon find something better than your current position. In fact, you've just received an attractive offer from a well-regarded company. The work itself is more interesting, the pay will be better, and your chances for further advancement will be improved, as well. That's the good news. The drawback is that it is that is an exploding offer. The hiring manager said, "You must give us a yes or no by 5pm tomorrow. And that deadline isn't negotiable." Before hearing this you were already leaning towards accepting, though expected to have more time to think it over. And you would have liked to explore other possibilities. (You already have interviews with two other firms scheduled for early next week.) It's possible that you might get an even better offer elsewhere, though you figure that the chances of that happening are about one in four. Click the button below to learn more about how this scenario unfolded and to share your own perspective. Then continue reading the analysis below. Choosing to make an exploding offer is a critical moment in negotiations. So is deciding how to respond to one. As we'll shortly see, they arise in a variety of settings. The motivation for imposing a short deadline for acceptance is clear: A hiring manager needs to fill positions in their company and doesn't want a prospect to use the offer as a bargaining chip with other firms. Someone putting in a formal offer on a new house doesn't want to lose out on other properties while the seller waits to see if someone else will show up willing to pay more. An exploding offer is an action-forcing event. The recipient of an exploding offer, a job hunter or home buyer, has to decide whether the deal now in hand is better on balance than chasing after a potentially better one. But it is not without cost. It can cause recipients to reject deals which, after some further investigation and reflection, they ultimately might happily accept. When that happens, the outcome is lose-lose for both sides. Volatile markets create conditions where parties making offers feel that they have no choice but to set quick limits on when they will expire. For example, law students compete for prestigious clerkships with judges. These positions give them a window seat to see how the judicial system works and to jumpstart their professional careers. Judges, in turn, compete with their own colleagues to hire the very best students. The candidate pool shrinks as other judges secure commitments, so there is an incentive to make offers earlier and earlier. Attempts have been made at establishing a common offer date, but judges jump the gun. By doing so, they subvert the norm. Offers in this marketplace sometimes explode in mere hours. One law student recalls that after taking a short flight, he turned his phone back on and found three voicemail messages from a judge that he had just spoken to. First, to make the offer. Second, to tell him that he should respond soon. Third, to rescind the offer. It was a 35-minute flight. Exploding offers can backfire, of course. There's a story that a major car manufacturer invited eight MBA students, all from top-ranked schools, to a final round of interviews on site. At the end of an intense day, the eight were brought together and told that the company was happy with everyone. There were two open positions, it was said, and those would go to the first two people to accept. But the ploy boomeranged. No one accepted the offer. The candidates resented being forced to make a hasty decision and treated as if they were identical spare parts. Exploding offers are features of other kinds of transactions, large and small. Some venture capital firms put a short fuse on their offers to invest in startups, especially in early stages of development. They understandably don't want their offers to be used as endorsements to lure other investors at better terms. But quick decisions can lead to mismatches between funders and founders. Some VCs (like Y Combinator, which helped launch Reddit and Airbnb) recognize that risk and are willing to give offers a reasonable amount time to breathe. Sometimes we may encounter exploding offers but don't recognize them as such. Online sales of commonplace items (clothing or office supplies, for example) sometimes have "buy-now" buttons that give you a deeper discount when you first visit the site. You'll be quoted a higher price if you come back later, after scouting other sellers. (A cookie tells the site that you've looked at the item earlier.) Retailers can track the effectiveness of such offers to calculate how generous they should be, where they should be placed, and if they generate enough added sales to justify the discount. Disputants who are close to the brink may seek help from an outsider. Litigants may turn to an impartial arbitrator, especially if they prefer airing their differences in private rather than having their case tried in open court. Or they may retain a mediator, again, provided they can agree on a trusted neutral party. A mediator cannot impose an outcome on the parties, however; they can only help them manage the process. Mediation styles vary markedly. Some mediators will privately caucus with each party to elicit their true interests and perhaps to offer an independent evaluation of their position. Other mediators believe it is important that the whole process is transparent. Many business contracts include provisions that require parties to utilize some form of alternative dispute resolution before resorting to litigation. If such requirements are not in place, parties in bitter conflict can have difficulty agreeing on what sort of process they should pursue. When litigants don't take such steps themselves, some judges will coax or even coerce them into settlement, believing that it is for their own good. Federal Judge Loretta A. Preska says that when courts "have to make a ruling, often it's with a meat cleaver." By contrast, the parties themselves may be able to "craft a settlement with a scalpel, a much more nuanced settlement that will make everybody happy." Her colleague Judge Richard Berman is known as a settlement judge. He says of himself, "I pursue settlement options early and often; I try to rule on motions quickly; and I try not to waste any time at trial." His proactive approach was evident in his handling of the lawsuit brought by professional football quarterback Tom Brady against the National Football League the summer of 2015. Earlier that year the NFL had suspended and fined the starting quarterback for allegedly using under-inflated footballs. Brady and the players' union challenged the league's evidence and its authority to impose those sanctions. Judge Berman put the case on a fast-track schedule and publicly recommended both parties settle rather than take the risk of an adverse decision. Many observers initially felt that the NFL was in the stronger position legally, in light of the collective bargaining agreement with the players' union, as it includes a provision granting league officials broad discretion in disciplinary cases. But as the trial unfolded, Berman's questioning of NFL representatives was particularly pointed. 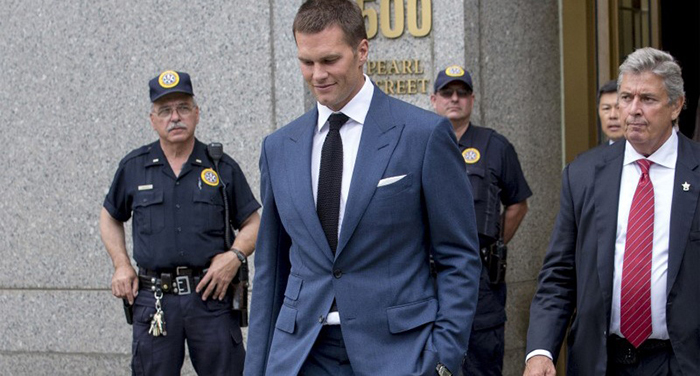 Some reporters interpreted that as evidence that the judge was sympathetic to Brady's position. Others speculated that Berman was trying to induce the league to compromise. Up to that point, the NFL was reportedly unwilling to lessen Brady's punishment. By contrast, news leaks indicated that Brady might be open to making some concessions. If the story was valid, it might have been a tentative olive branch to the league. Or perhaps the gesture on Brady's part was meant to look more reasonable in Judge Berman's eyes. (For a fuller assessment of the negotiations as they were taking place in the shadow of the lawsuit click here. It turned out to be a temporary victory for Brady and his team, however. The NFL appealed Judge Berman's decision to a federal appellate court. While that case was pending, there were no rumors about behind the scenes settlement talks. The higher court ruled in favor of the league, so the quarterback was barred from playing the first four games of the 2016 season. This may be an example of a situation where both sides were willing to go to the brink and beyond rather than assent to a compromise. Brinksmanship is more common in disputes (for example, lawsuits, work stoppages, and international conflict, for example) than in transactional negotiations because it requires both the capacity to impose a cost on other parties and a declared willingness to suffer costs oneself. In pure deal-making, assent is won by offering others something superior to what they would otherwise obtain (another deal with another party). In brinksmanship, it's a matter of threatening to make the counterpart worse off unless they agree. Likewise, while much of negotiation is about expanding options, brinksmanship is about burning bridges with the intent of limiting the other party's choices. Such acts can be provocative. People don't like coercion, especially if it leaves them in a position of having to choose the least onerous option from a set of possibilities, none of which are attractive. A contest of wills can erupt where whatever issues were originally in dispute are overshadowed by the perceived need to win or at the very least to cause the counterpart to suffer even greater pay. Harvard Business School professor Deepak Malhotra and others have written about how winning sometimes becomes everything in auctions, acquisitions, and of course lawsuits. Emotions can overwhelm reason. It is seldom in your interest to provoke counterparts to have that reaction. If you are interested in reading more on this topic, be sure to look at the Ultimatums module in this unit on Critical Moments. Graham Allison, Essence of Decision, (second edition with Philip Zelikow), Person, 1999. Amir Efrati, "Judges Behaving Badly: The Clerkship Edition," Wall Street Journal Law Blog. Bruce Henderson, "Brinksmanship in Business," Harvard Business Review, March 1967. Gary Klein, Intuition at Work, Doubleday, 2002. Wade Lambert, "Ever Hear the One About the Lawyers and the Window Bars," Wall Street Journal, March 23, 1994, p. 1. Deepak Malhotra, Gillian Ku, and J. Keith Murnighan, "When Winning is Everything," Harvard Business Review, May 2008. Thomas Schelling, The Strategy of Conflict, Oxford University Press, 1960. Click on the red Discussion Forum bar below to share your ideas, insights, questions, etc. with other users. Feedback on Negotiate 1-2-3 in general or specific modules can be submitted through our General Feedback form.